Gabions are free-draining walls that are constructed by filling large galvanized steel baskets with rock. 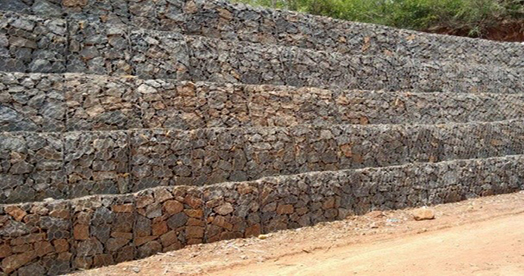 Gabion walls are in many applications the most cost effective structural wall available. Gabion baskets are available in a variety of different sizes. They come in 1/2 or 1 meter high, and 2, 3, or 4 meters long. There are several types and colours of rock available from common river type round rock, to multi-coloured light and dark fractured rock. Flexibility is an important benefit of any gabion structure. Since the baskets are constructed of galvanized mesh wire and filled with rock, the flexibility of a gabion structure allows it to withstand pressure without deforming, cracking or breaking as in the case of concrete and other materials. There are very few limits when it comes to the construction of a gabion wall. Walls can be constructed following grade along a road, tapered on top to follow changing elevation or terraced creating stunning flower gardens that can flow over the wall.